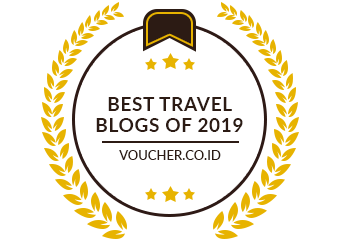 Being described as an “Untouched Piece of Art” by Jacques Cousteau, Sipadan Island is always high on the chart of best dive sites and frequented by scuba divers from all over the world. 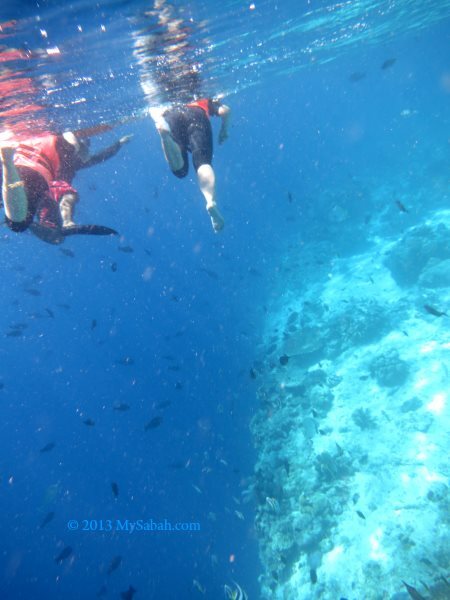 To promote Sipadan, travel agents like to use underwater photographs of divers, as if the only way to see the beauty of Sipadan is to wear over 30 pounds of diving gears and sink to the sea bottom. 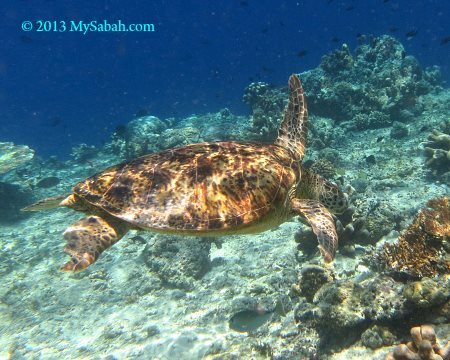 So, is swimming and snorkeling in Sipadan just a waste of time? 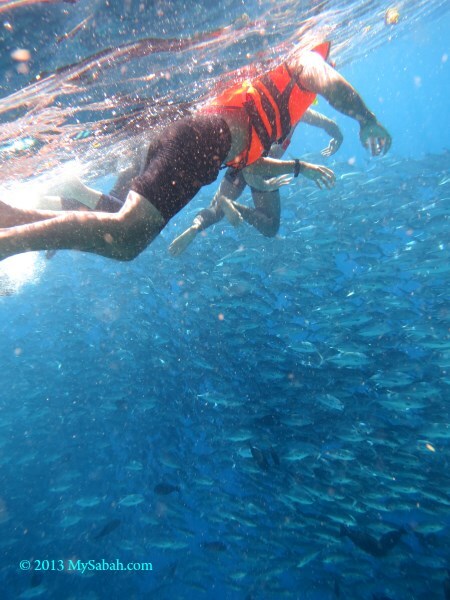 Read on, you will see that Sipadan is also best for snorkeling. 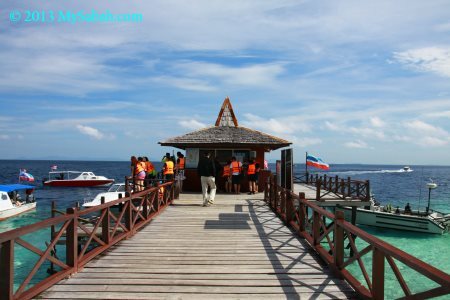 Sipadan is the only oceanic island of Malaysia and its reef is built on a volcanic seamount which rises steeply from a surrounding seabed more than 500 Meters in depth. 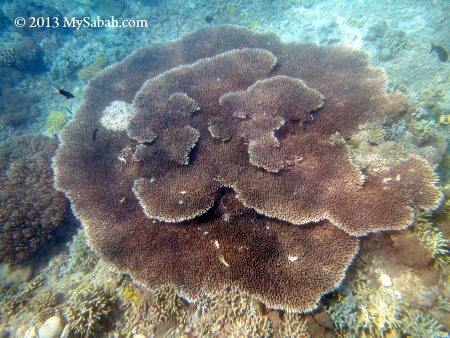 In brief, Sipadan is a mushroom-like island in the deep ocean. This 13.5-Hectare island, which takes only 20 minutes to walk one round, looks like an ordinary tropical island, but there is a lot of going on under its water. Pic: the deep blue seawater is the 500 Meters drop. Sound scary, but a lot of corals bloom on its steep wall and become “hanging garden”, which is famous for Wall Diving. 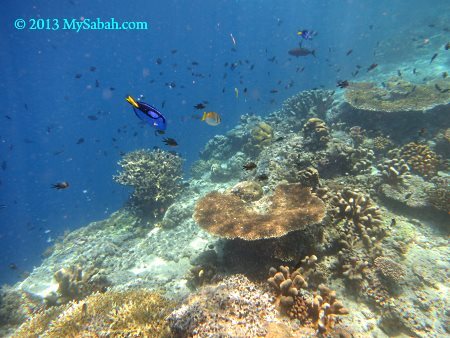 In my last visit to Sipadan, I snorkeled in 3 sites, which are only 3 to 6 Meters deep and not far from the island. The visibility of Mid Reef is good in the morning. 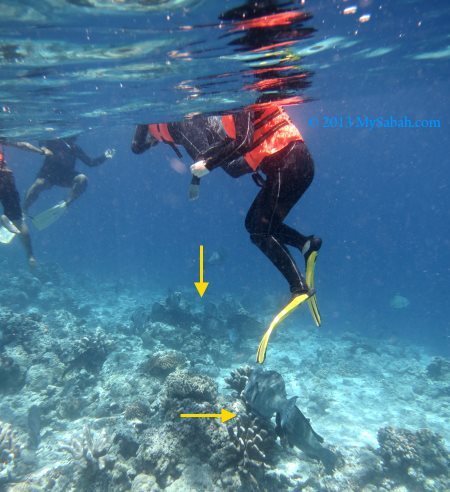 The water is about 3 Meters deep, so I can get a close and clear view of flourishing hard corals. Pic: big fan coral, which is bigger than me. 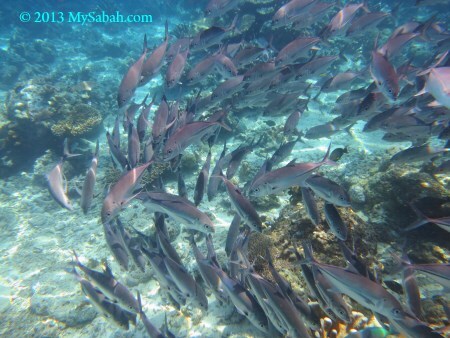 Fishes like to congregate near the edge of island. 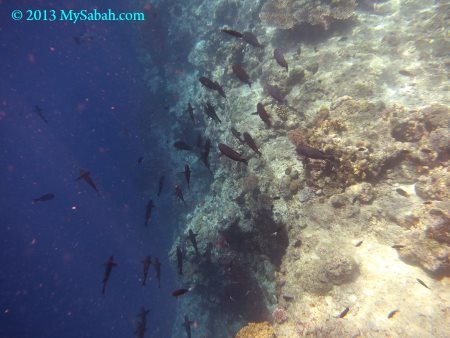 I saw thousands of reef fishes in different colors and sizes in coral reefs, like butterflies among the flowers. 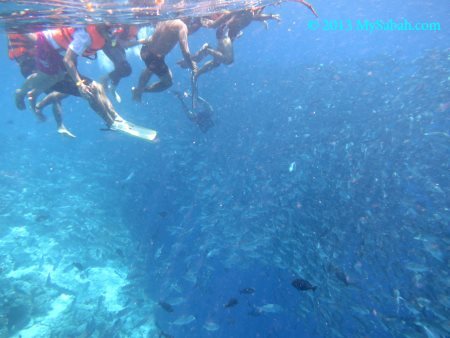 A popular TV host from National Geographic Channel once said he was dazzled by the fishes here LOL. 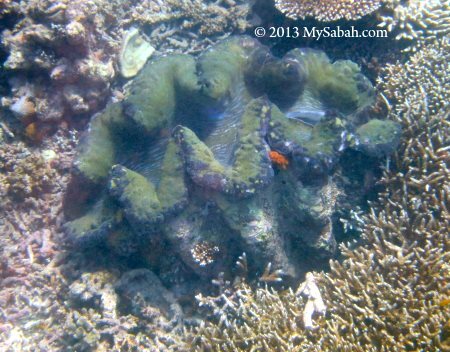 I also spotted a live giant clam about 3 feet in wide. Due to overfishing, it is extremely rare to see such a big one in the wild. 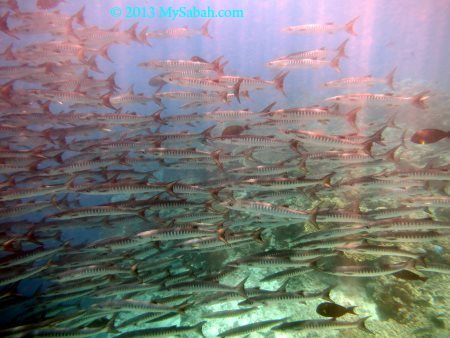 A school of Barracuda just appeared in front of me, as seen in tourism brochure. This magnificent view was totally unexpected because I thought I only can see this in deep water. I was so happy with what I saw. Quickly I proceeded to the next site, the Turtle Tomb. The sunlight was getting bright so the visibility is superb. My underwater camera could record everything clearly. It was not too long for me to find a sea turtle swimming gracefully, then came the second, third and fourth one. Sea turtles are just everywhere. Surprisingly, they didn’t bother about my presence so I could see their natural behaviour up close. Some turtles were resting at the bottom. Like the one above was just a few feet below me. To avoid disturbing it, I stayed still and let current pushed me away. It looked fairly relax and didn’t try to hide or flee. Then I noticed something big and dark moving under me. 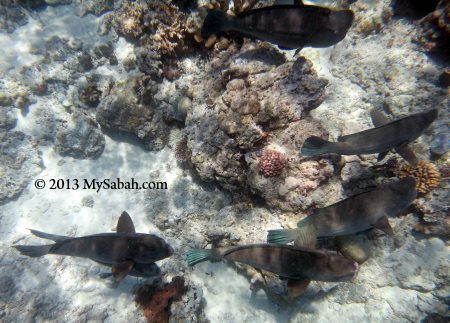 It was a group of Bumphead Parrotfish foraging around corals. Can you believe it? 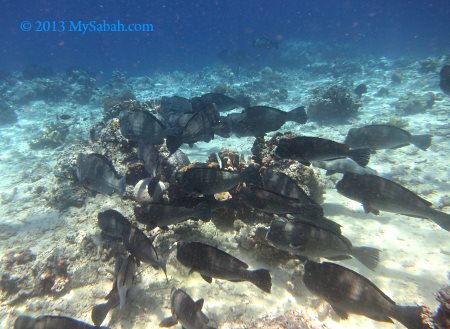 Nearly hundred of Bumphead Parrotfish were so close that our fins almost touched them. I only saw Bumphead Parrotfish in seafood dinner before, without knowing that it is such a fascinating creature. I had my lunch after two snorkeling trips. After a short rest, I couldn’t wait to get back to the water again. Sipadan is located in Coral Triangle, which is also known as Amazon of the Sea and important habitat to over 3,000 coral fish species and 76% of world’s coral species. When I thought the best part was over, I saw a big swarm of “something” coming to my way. My goodness, it is a school of Jackfish, probably ten of thousands of them. This is crazy! 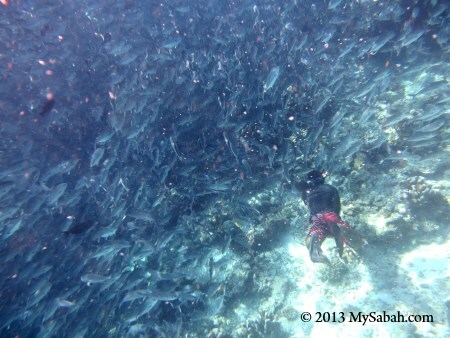 A guest swam to them and soon engulfed by wall of Jackfish. Before this, I thought such view was something only happened in my dream. I strongly recommend you to watch the video. The fishes didn’t look stress though we were really close, a result of long years of full protection by this marine park. In case you wonder how Sipadan got its name. The name is from the word Siparan, which refers to a dead body of a person named Si Paran, whom had been found restlessly on the beach of Sipadan. 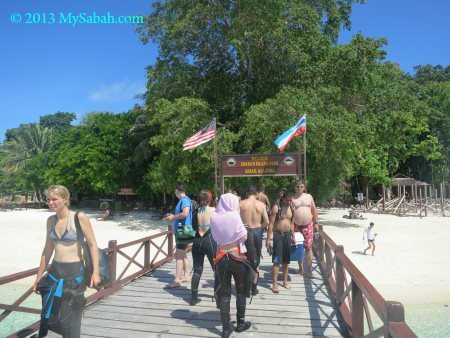 To visit Sipadan Island (Pulau Sipadan in Malaysia language), you need an entry permit from Sabah Parks, the management of Sipadan Island Park. 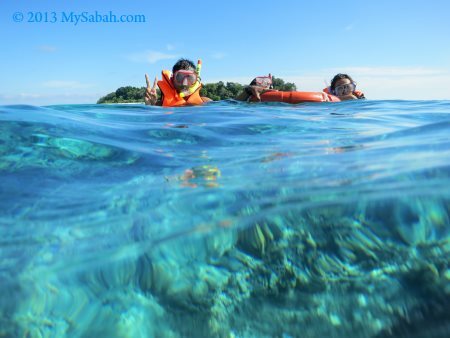 To reduce the impact to the environment, Sabah Parks imposes a daily quota of 120 people to Sipadan. The tour is always fully booked, so you need to apply at least 3 months in advance. 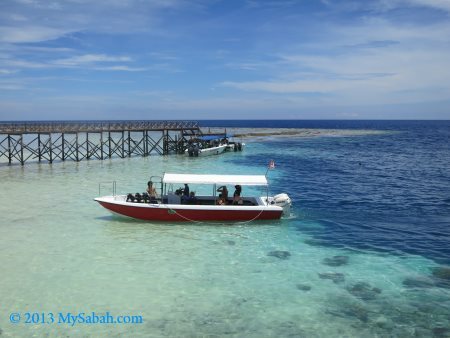 The easiest way is to get a licensed dive operator to arrange the diving trip for you, they also can book the accommodation and provide the airport transfer. Pic: the reception counter at the jetty. Everyone must register here before entering the island. You will be denied entry if you don’t have a permit. 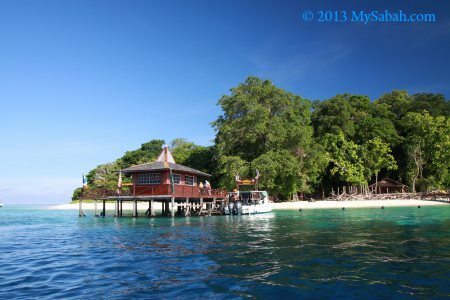 Pic: the boardwalk to Sipadan Island. Do you notice the big tall tree? 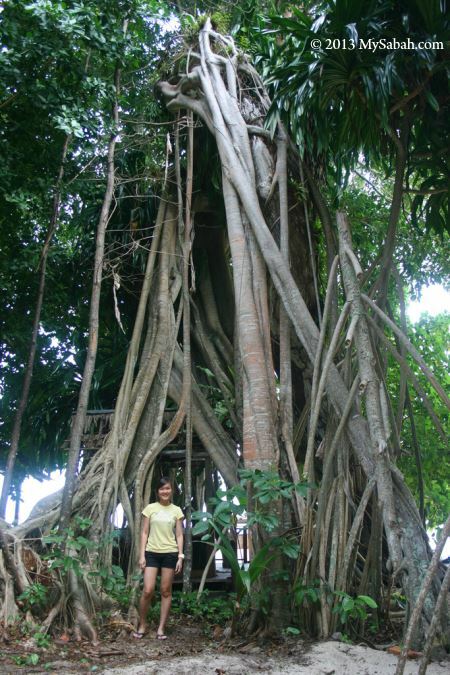 It is a huge strangler fig tree (see photo below). 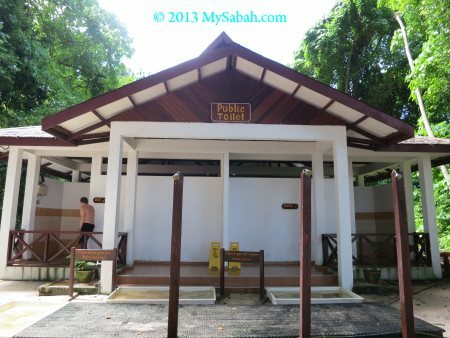 Pic: The island has adequate amenities such as public toilet for tourists. Pic: there is a few shelter and benches for you to rest and have meal. FYI, there is a Turtle Hatchery on Sipadan. 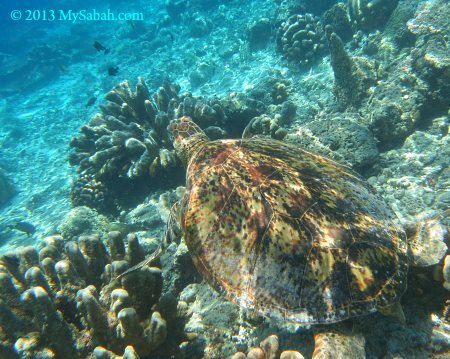 Do you know any other nice spots for snorkeling, besides Sipadan? Please share with us.